Kara chutney is a spicy and mouth watering chutney prepared with onion, tomato, tamarind, dry red chillies which is hot and spicy. 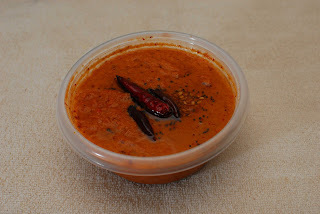 Kara chutney tastes good with Idly and Dosa along with sambar and coconut chutney served in most of the restaurants, hotels, street food takeaway in Tamil nadu. This can be used as spread while making some spicy sandwiches. Try this spicy south Indian chutney and Enjoy Cooking!!! 1. Heat oil in a kadai, fry onion till they become golden brown. 2. Add tomatoes and fry till the oil comes out and keep it aside. 4. Allow both to cool down. 6. Temper with urad dal,mustard n red chilli. 7. Serve with rava idly, idly ,dosa, paniyaram, ven pongal, curd rice and jeera rice.